The fjords of Tierra del Fuego are some of the most beautiful and mysterious waterways in the world. Situated at the most southerly point of Chile and Argentina, Tierra del Fuego’s rich wildlife and spectacular landscape are unrivaled. What’s more, this precious natural environment is also home to fascinating culture and history. From the traditions of indigenous Fuegans to the land that inspired Charles Darwin, the fjords are brimming with discoveries. Therefore, the best vantage point from which to see this marvelous land is by boat. Australis has been navigating these fjords for 25 years, taking travelers to the most remote locations in true luxury. Here, we introduce the Ventus Australis and its passage along our Fjords of Tierra del Fuego route. Meaning, ‘southern wind’, the Ventus Australis is the ideal vessel to navigate unexplored corners of the Patagonian fjords. Built by renowned Chilean shipbuilders Asenav, the Ventus is agile enough to enter narrow channels where no other cruise ship can venture. Additionally, like the Stella, the Ventus meets the highest standards of sustainability, protecting the marine environment. However, just because the ship is nimble, doesn’t mean it’s basic. For example, the Ventus is staffed by our high-end chefs and friendly guides, which make the journey luxurious and welcoming. Moreover, comfortable rooms and spacious lounges make the Ventus Australis a relaxing base for a Patagonian adventure. A spectacular route aboard the Ventus Australis is our Fjords of Tierra del Fuego trip. A four-day, four-night route from Punta Arenas to Ushuaia, the cruise navigates some of the most incredible landscape in Patagonia. The Ventus sets sail from Punta Arenas in the afternoon, heading towards the Magellan Strait. During the first evening, travelers are welcomed by the captain as the twinkling lights of Punta Arenas fade away. The next morning, the ship sails up the Admiralty Sound past the snowy peaks of Karukinka Natural Park. Once the ship reaches Ainsworth Bay, passengers set off on their first Zodiac excursion to spot wildlife. For instance, travelers can see a wealth of bird species, or even elephant seals. From here, the boat heads towards the Tucker Islets to visit the enormous penguin colony. Overnight, the Ventus sails towards to Magdalena and Cockburn Channels. Next, the cruise enters the Pia Fjord, where passengers can board a second Zodiac excursion to get up close and personal with the Pia Glacier. After disembarking for a short hike, travelers head back to the Ventus to begin the journey down Glacier Alley. Here, the ship passes a number of breathtaking tidewater glaciers. For the final full day, the ship heads towards Cape Horn National Park. Weather permitting, travelers go ashore to explore this legendary landscape and find out more about its amazing history. For example, the trip includes a visit to the historic Wulaia Bay. Here, passengers have the opportunity to learn about indigenous cultures and rare endemic species. Finally, the ship heads towards Ushuaia, where the voyage concludes. 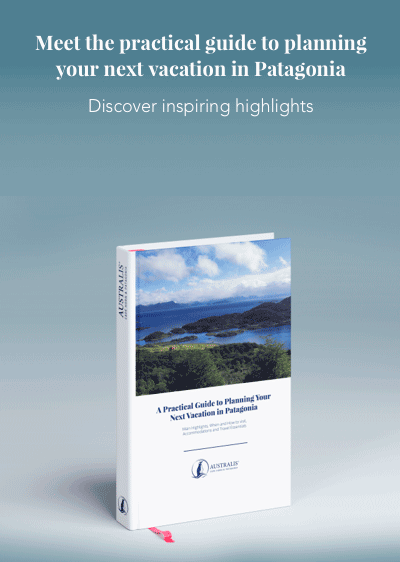 A cruise through the fjords of Tierra del Fuego is an experience you’ll never forget. With astonishing views, fascinating history, and incredible wildlife, a trip on the Ventus Australis is so much more than a vacation – it’s an adventure. 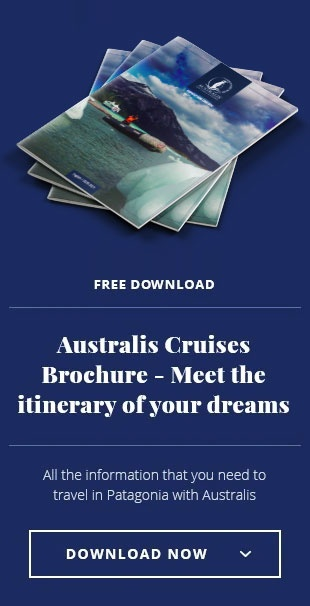 If a voyage with Australis has sparked your imagination, download our brochures to plan the adventure of a lifetime.